Unsurprisingly, there is one man dominating the headlines after Derby were cut down to size at Rotherham. Frank Lampard, in his first few months of management and arguably the most high-profile name in the Championship, was sent to the stands as his side fell to a 1-0 defeat at the AESSEAL New York Stadium. 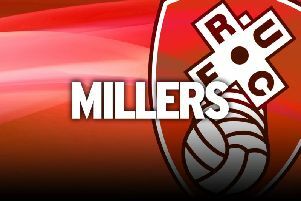 The column inches will be hogged by the former England midfielder, but do not let that take the attention away from a wonderful performance by the Millers, who deservedly took all three points thanks to Ryan Manning's second-half penalty. This was classic Rotherham in the Championship. They played with high intensity, unsettled their opponents, outfought them and continued to cause a threat from set-pieces, showing the mix of ingredients which, on this evidence, will be the recipe for comfortable survival. “I am pleased, I am obviously over the moon,” manager Paul Warne said. “Our first-half performance deserved a goal and if we had gone in 2-0 up it wouldn’t have flattered us. Warne might be referring to three key incidents in the game all going his side's way. First Derby went down to 10 men when Tom Lawrence, a former Millers loanee, was sent off just before the hour for a nasty tackle on Richie Towell. Warne described it as a “strong yellow” while Lampard suggested the reaction of the home side contributed to referee Peter Bankes' decision. Five minutes later the decisive moment came when Richard Wood went tumbling in the area and after advice from his linesman, Bankes pointed to the spot, with Manning sweetly converting from 12 yards. Then, in the 77th minute, Lampard was told to watch the remainder of the game from the stands after protestations at his side not getting a spot-kick. But this was no hard-luck story for Derby, they were outplayed. And results like this will become the norm for the Millers, if Warne gets his way. “I don’t want the lads to see it like they’ve won a cup final,” he added. Lampard, who suggested the state of the award-winning New York pitch played a part in his side's defeat, was left taking centre-stage, but it was Warne's side that stole the show. Rotherham: Rodak, Vyner, Ajayi, Wood, Mattock, Williams, Towell (Palmer 86), Vaulks, Manning, Smith (Proctor 78), Vassell (Taylor 71). Unused: Price, Jones, Wiles, Forde. Derby: Carson, Bogle, Keogh, Tomori, Forsyth, Huddlestone (Holmes 73), Johnson, Mount, Lawrence, Jozefzoon (Bennett 64), Waghorn (Marriott 64). Unused: Roos, Wisdom, Malone, Ledley. Attendance: 10,707 (2,603 from Derby).